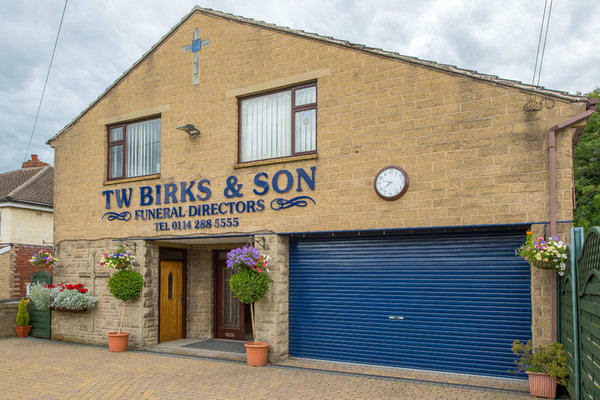 T W Birks & Son Funeral Directors have served the local community from our funeral parlour on Manchester Road since 1972. We take great pride in our work, ensuring that every person in our care is treated with utmost kindness, compassion and respect. Our funeral home in Deepcar is easily accessible from the surrounding areas including Stocksbridge, Bolsterstone and Wharncliffe Side. We also have additional funeral homes in Netherton and Huddersfield. Our facilities are tastefully decorated to provide a calming and welcoming atmosphere whenever you visit. We have a private chapel of rest which you can use to spend time alone with your loved one before the funeral, as well as a family arranging room. We cater to all cultures and religions, and we are here to give you our full support at all times, including offering any advice or guidance you may need. You can reach us by telephone at any time, day or night. Call us today on 0114 288 5555 to talk through your personal requirements. There is parking for two cars at the front of the funeral home, and free on-street parking. We are on Manchester Road, next door to McColls Petrol Station. Our staff are available 24 hours a day on 0114 288 5555 if you require our services outside of these hours. Excellent service - professional, caring, sensitive, respectful and totally efficient, especially Ian. I would not hesitate to recommend T W Birks & Son. Highly professional and caring service. T W Birks was amazing throughout, i could not recommend them enough. Joe who was my mums undertaker was amazing and made me feel like she wasn’t just doing her job but a friend. An excellent and professional service, carried out with exceptional care and compassion. Ian and his team did everything with the utmost respect and dedication, can not thank them enough for their help and guidance at such a difficult time. Would highly recommend their services. Thank you for taking the time to complete the online review. I am pleased that our team provided the highest level of care and guidance and that we were able to help make things easier for you at such a difficult time. Very satisfied, condiderate and very professional service, in particular given that the service was a burial involving travel from the funeral home in our village to the church and Cemetary at the other side of Sheffield City. All the staff where very kind and understanding, in particular Joy who made all the arrangements on our behalf and kept us informed throughout the process. From first contact through the whole process TW Birks have been pretty much perfect. Jo looked after us in a professional and sympathetic way. Thanks from all my family for this. Joy and the entire team at TW Birks were fantastic with all aspects of my mothers Funeral. From the start and udnerstanding our needs, throughout the day and then afterwards, they were professional, polite and curteous at all times. They made the entire process as comforting as possible at all times and I would highly recommend them. Thank you for taking the time to complete the online review. I am pleased that the arrangements for your Mother were carried out to your satisfaction and that we were able to help make things easier for you at such a difficult time. Fiona and the team were great - every aspect taken care of and done superbly. They handled the entire situation and the funeral itself with all their attention and respect. Very highly recommended. Excellent care and quality from start to finish, down to the last little detail. Couldn't have asked for anything better at this difficult time. Highly recommended. We were very impressed with the level of care and attention we received. We were dealt with in a warm, but professional manner, sensitive at all times. I felt no query was too small or insignificant to raise, and someone was always on hand to reassure us. We were able to communicate our mum's wishes, and everything possible was done to create the sort of funeral service she would have wanted. We can't recommend TW Birks highly enough. Everything about the funeral went to plan.All the arrangements ran smoothly which avoided any stress for us all.The fact that we were visited at the house made things easy & advice given was much appreciated..My only reservation would be that my son delt with a lot of things by email & had he not been there I would have been lost!I expect that in these circumstances you would take this into account!